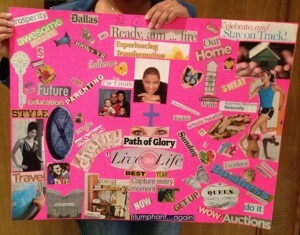 What is a Vision Board Workshop? A vision board (sometimes called Treasure Boards, Goal Boards, or Dream Boards) is a tool used to help clarify, concentrate and maintain focus on specific life goals. Literally, a vision board is any sort of board on which you display images that represent whatever you want to be, do, or have in your life. It supports focus, drive and direction. Vision boards also allow our subconscious mind to react to the images that you are inspired by thus creating as state to Act “as if” the goals have already occurred. To say “I want a better life” is a fantastic goal, but most people have not given serious thought to exactly what that means and looks like. For some, a better life might mean having a new car or home. Others may be seeking a new relationship or improvements in existing relationships. Doubtless you have heard it said that most of us never get what we want because we don’t know what we want. By envisioning what your “better life” looks like and then creating a vision board to as a tangible representation of what you want. 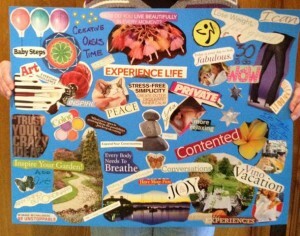 Making a vision board is a wonderful way to bring clarity to that general desire and turn it into an achievable goal. Goal setting – what it is, how it can help you move forward, how to set compelling goals and how to create your own plan. Learn how to set your intentions and why this is so important.